The trial of ‘Saddam Hussein’? It is with sadness that We watch the continuing efforts of men to solve their problems with the methods of the past. These problems are many and relate to the future as much as to the present. In the main, they are relics of the past and represent a heavy burden for the burgeoning societies of today. Lost in their fierce battle for markets, governments everywhere try all the standard ways to achieve security and strength, development and innovation, and stability in the midst of change. It is an impossible task. There is but one answer to all their troubles, one solution to all their problems, yet none, so far, has ventured to whisper the word which, at a stroke, would free them and the world. Which, at one stroke, would launch this world into the new era of Righteousness and Truth. Let the word resound, let the word demonstrate the new civilization, the new society. Let the word be heard everywhere; let man respond. The word is the sound of righteousness, it is the sound of truth. The word brings all men together, and builds the Brotherhood of men. The word sits lightly on the heart, bringing happiness to all. The word is wise and generous, filled with love. The word is sharing, the key to the future. Sharing is the answer to all men’s problems. Sharing is another word for divinity. Sharing initiates the highest that is possible for man for it opens the door to trust. Sharing will take men to the feet of God. When men learn to share they will know the meaning of life. When men share they will feel exalted and love what they do. Sharing will make men whole. Sharing will make man One. There is no end to the concept of sharing. It will prove the salvation of men. When men see Maitreya they will hear these words of Truth. They will listen to His pronouncements with wide-open hearts, and, responding, will call for the end of tyranny and injustice. They will gather around Him and He will be their spokesman. Soon, men will see His face. Soon, He will present His ideas to the world and usher out the old age. He is near men now. He cannot be denied. His love now saturates the planes and brings change to the fore. Consider this: without Maitreya’s help man is doomed. We earnestly await the response from men. Q. Could your Master please say how many people marched on the peace demonstrations on Saturday 24 September 2005 in (1) Washington and (2) London? (3) Was Maitreya present on either march? A. (1) 55,000. (2) 70,000. (3) Yes, both. Q. Has Maitreya charged all of the 777 healing wells as planned and as mentioned in your books? A. No, not yet. He has broken off doing this for the moment. He is extraordinarily busy now. There are approximately 240 wells which have already been charged energetically by Him. He will continue this work in due course. Q. What caused the very powerful (7.6 magnitude) earthquake in Pakistan — about 60 miles (100 kilometres) north-northeast of Islamabad? A. It was the result of underground nuclear explosions by Pakistan. Q. Hurricanes Katrina and Rita hit the Gulf Coast of the USA; tropical storm Stan hit Central America and Mexico. China and Taiwan have been battling extreme weather conditions. I read that Katrina was a result of US foreign policy and the fear and tension resulting from it. (1) Was Rita also a part of the same process? (2) Could you please explain the causes of hurricane Stan? Is it the tail-end of the Katrina phenomenon? Q. Recently in Share International you said the death toll from hurricane Katrina would be 12,000 instead of the approximately 1,200 now confirmed. Should we assume that Mr Creme misheard the number from his Master? I honestly am astonished how he keeps the massive amount of information straight in his head. A. No, up to 12,000 is accurate. The figures have been manipulated by the US administration (more lies). A large number of bodies, even now, have not even been counted. The Mayor of New Orleans himself said, at the time, that they must expect at least 10,000 deaths. Q. I wonder about the information about 12,000 dead people after the Katrina disaster. Is that the right information? I heard that approximately 1,200 are found now and there are probably no more bodies to find, definitively not 11,000 more to find. I also wonder about the information that Saddam Hussein captured a while ago actually is not Saddam himself, but a look-alike. Is this still the right information? A. Both answers are accurate. Saddam Hussein is dead. The number of deaths in the Gulf Coast area has been manipulated by the US administration. Q. With all the lies and manipulations being uncovered in the last few years I can hardly believe a word that Tony Blair, George Bush or their governments say. Recently security on New York’s subway was stepped up after city officials said they had received a “credible security threat”. At the same time George Bush held a press conference announcing how the US and its allies had foiled 10 major terror plots since the 11 September attacks, in a speech designed to boost support for the so-called ‘war on terror’. The BBC wrote: “The sketchy details provided by the White House make it hard to assess how serious or advanced the plans were.” The situation is very confusing. Is this yet more manipulation and propaganda from the US government? A. Yes. There was only one genuine terror attack which took place in London on 7 July 2005. The others were vague, sketchy and surmise. Q. Is the group Al-Qaeda really as structured and organized as the US and UK governments lead us to believe when talking up their ‘war on terror’? A. No. It is a loose collection of people who share the same ideals and grievances but carry out their acts of terror on an ad hoc basis. Q. When Maitreya begins to make His media appearances, even though He won’t be stating Who He is at first, would it be advised for co-workers who recognize Maitreya not to point Him out to people outside of the network (including family and friends) because it would interfere with the freewill of an individual to recognize Maitreya for themselves? A. Yes. I have several times made it clear to co-workers that this should be the procedure. It is very important, especially in relation to media, that their and others’ freewill is not infringed and that they respond to Maitreya for what He is saying as a man among men rather than as the Christ or World Teacher. Q. You say that when Maitreya comes on television first, He won’t be called Maitreya. How will people invite Him on television? What will His qualifications be? A. He will have a name, but it will not be Maitreya. The point is He does not want the ideas to be coming from a Being so high that people become devotees. He does not want devotees, He does not want followers. He says: “If you follow Me you will lose Me. If you try to put Me in your pocket you will never find me.” The Christians will try to put Him in their pocket. So will Muslims, so will Hindus, and especially Buddhists. It is not a problem; if He is invited on television to speak, He can be invited on another channel to speak to more people. It is as simple as that. On the Day of Declaration He will acknowledge what many people suspect but may be unsure of, that He is the World Teacher. He will be invited as Mr So-and-So to speak about his ideas. It will be restrained at first, He will not say what I am saying at first, but He will grow in intensity as people around Him respond. If He said what I would say He would drive people away from Him. He does not make a difference between fundamentalist Christians, fundamentalist Jews, fundamentalist Muslims, and so on, and non-fundamentalists, He does not make that difference. He has thousands of followers who at some level have experienced Him and they know Him. It is hard to describe. He is totally tolerant, non exclusive. Q. According to one of Madame Blavatsky’s books, the Apostle Peter lived in Babylon after the crucifixion. Does that mean he was not martyred under Nero, was not the first Pope, nor buried at the present site of Saint Peter’s Basilica in Rome as claimed by the Church; that he did return to Rome after a time, or that Madame Blavatsky dreamed up her own account (either in Isis Unveiled or Secret Doctrine, not sure which) as she did some other materials like (as it says in one of the Alice A. Bailey volumes) parts of the Mahatma Letters? Or is this the kind of question that only the Masters could answer and are not going to? A. This is the kind of question that only the Masters could answer and one is going to now: Madame Blavatsky is correct in her statement that the Apostle Peter did indeed live in Babylon after the Crucifixion. He was instructed to do this after the death of Jesus and continued the work of teaching and healing among the groups who had responded to the teachings of Jesus. He was not martyred (upside down or right way up) under Nero, was not the first Pope, nor buried in Saint Peter’s Basilica in Rome as claimed by the Church. There are many other inaccuracies of this kind in the Church’s teaching which have still to come to light. However, I do not think these inaccuracies are all that important; the basic teachings of the Christ through Jesus are the important things. Q. Of the 12 disciples, we learn that most of them suffered a martyr’s death: Jude and Simon in Persia, James the Greater in Spain, Thomas in India, Matthew in Ethiopia, and that Andrew, James the Lesser, Matthias (who replaced Judas) and Peter were crucified, leaving John, Bartholomew and Philip who did not die as martyrs. How accurate is this information? A. Simon, James the Greater and James the Lesser were crucified. Jude, Thomas, Matthew and Matthias were martyred in various ways. Andrew, John, Bartholomew, Philip and Peter died natural deaths. At the end of July 2005 there was an exhibition of ‘the Maitreya Project’ at the museum of ethnology in Hamburg, Germany. For five days ‘pearls’ of the Buddha and other highly evolved lamas and monks from different Eastern countries were on display. These relics, looking like pearls and mostly white, remain in the ashes after the body of a highly evolved person is cremated. There was a crush of people who wanted to see them. The Project was introduced through a film about the 153-metre Maitreya statue to be built soon. We, of course, were pleased to have the opportunity to tell him about the World Teacher, Maitreya, who now becomes more and more present and well-known in the Western world. We added that, to our minds, the big statue of Maitreya to be built in Kushinagar, Uttar Pradesh, India, in 2012 is a symbol of the new time. He thanked us and said that now he would understand better — while I, fascinated, looked into his eyes: light grey eyes surrounded by a dark grey ring. But what was much more unusual about them was their expression. They looked a little bit astonished — and utterly harmless! Then we lost sight of him. About an hour later, we were sitting down for a rest in a corner, enjoying the energy and watching the crowds, when, on his knees the young man crept slowly and in a very devoted manner to the Lama who was giving blessings. Back home, I looked at a photo on the wall, which shows the head of the golden Maitreya Buddha statue in Tibet and suddenly realized that the Buddha had eyes very similar to those of the young man: only light blue instead of grey. Who was the man in the museum? H. D., K. B., U. C., Hamburg, Germany. On 17 July 2004 I gave a talk in a bookstore at Trujillo Alto, Puerto Rico, to let people know that Maitreya is in the world and to recommend Benjamin Creme’s books. Before the beginning of the talk, a man stood up behind me and said: “I know who is Maitreya. Maitreya is the One who was inside Jesus in Palestine.” I was surprised and turned around to see who was talking to me. I saw a man around 55 years old, 5 feet 9 inches tall, very well dressed in casual clothes. He looked like a Puertorican but had a Spanish accent. I told him that I was glad that he knew who Maitreya was. He stayed for a short time drinking a cup of coffee. When I started the talk I noticed that he was not in the bookstore and I didn’t see him again. After the talk finished and people were leaving, they were astonished to see a rainbow in the sky starting on top of the bookstore. A short time later the rainbow disappeared, but when I went outside, it appeared again and my husband videoed it. Could you please say if this man was a Master and if the rainbow was a coincidence? T. M. S-G., Guaynabo, Puerto Rico. A few years ago I had a lady to help me with my housework. Her name was Gordana, and she came from Bosnia. When we got to know each other she asked me about the photographs of Maitreya’s ‘hand’ and Sai Baba that I had in my apartment. I explained about the use of the Maitreya’s ‘hand’ and gave her a copy of it. As soon as she arrived home she put her mother’s picture on the ‘hand’ and prayed for her health. Her mother, Milja Savi, who lived in Bosnia, had been discharged from hospital with a diagnosis of untreatable malignant tumours. After three months Gordana visited her mother and saw that her health was much better. During these three months she prayed for her all the time with the help of Maitreya’s ‘hand’. (She never told her mother what she was doing.) After three months her mother went for a medical examination in the hospital, but the doctors couldn’t find anything wrong. They couldn’t believe it and made additional examinations, but she was completely cured. After another month she could dance and live as if the disease had never been there. When Gordana told me the story, I immediately said that this must have been Maitreya’s work. Now we wonder if this is true? In June 2005 my friend Josy and I journeyed to London, England. In the train near Lille, a ticket-collector entered our carriage (see picture). He immediately takes out a flame from his jacket. Then he begins to perform magic tricks with cards and telescopic sticks, and inflates balloons and transforms them into different animals. 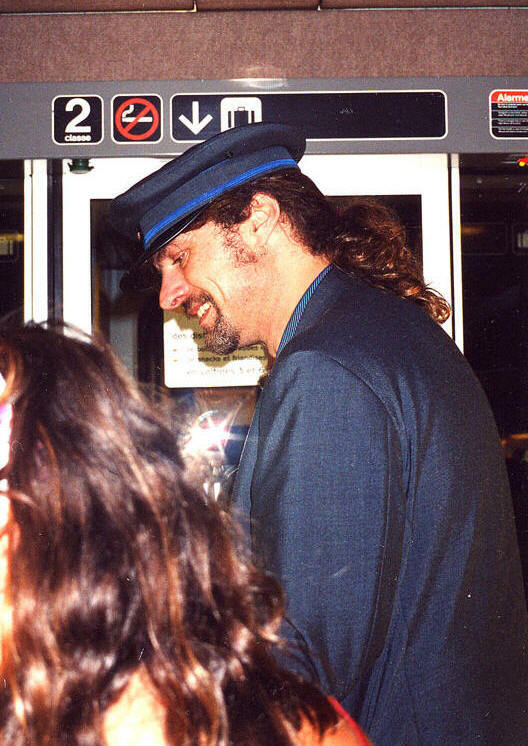 Passengers are astonished and happy. They talk to each other, laugh and exchange seats. Then he continues his show for the other passengers of our carriage, closing a man’s mouth with a piece of scotch tape telling him that he speaks too much, and inviting a woman to change the way she sat because she was not in the right position. Coming back to us, he says: “Everything is illusion,” and “When one knows that, life becomes simple.” He looks fixedly at Josy for a long time while creating another toy. She is not looking at him, but secretly hopes that he will give her something. He goes away and discusses with other passengers, then comes back to her and gives her a teddy with a candy under its arm. A woman wearing a white felt hat comes to me and asks me: “What do you think about all this?” “It is wonderful,” I answer. “Do you really understand what is happening now?” she insists. I say “Yes,” feeling like crying. I take some photographs (enclosed herewith). I still remember how delicate and fine his hands were. They make me think of the photograph of Maitreya’s hand. I often think about this necessity to work with the heart and try to apply this advice since our delightful visit to London. In fact, I feel more serene. Josy also feels better and more dynamic after this encounter. Who was that man? Was the woman one of the Masters or a disciple? In July 2005 I participated in the annual French co-workers’ meeting in the Jura. During our journey, I showed my friend Rose-Marie the ticket collector photographs. We were five people in the car and Rose-Marie was sitting beside me. I felt very tired and had a stomach ache. After analysing the phenomenon, we realised that it was the photograph, not the car window, which was reflecting the light. We were all very impressed. I felt more dynamic and my stomach ache disappeared. Have these light reflections and the cross a particular meaning? On Sunday 2 October 2005 I spent a sunny, blustery day walking in Kew Gardens. On my way home, I began to dwell on difficulties rooted in past mistakes, and my expansive mood evaporated. Suddenly I was overtaken by a young black man, singing as he passed, and striding out at a pace much faster than mine. He was dressed head to toe in brilliant orange: brick-orange woolly hat, vivid lifebelt-orange jacket, huge orange rucksack, and immaculate, shiny orange patent-leather Nike shoes. But brightest of all were his baggy trousers: luminous orange silk or nylon, festooned with bulging cargo pockets and fastening tapes, they fluttered in the breeze like gigantic prayer flags. He was so bright that everything around seemed monochrome by contrast. Immediately Maitreya crossed my mind — but not every unusual person has to be Maitreya, I told myself. A swami? Surely not, far too trendy. He quickly left me behind and flickered away like a flame over the crown of Kew Bridge. But his brilliance and momentum had lifted my spirits, and I found myself thinking of how orange is the colour of fire, of renunciation, and how swamis renounce their past to take on their new lives. It struck me forcefully that I should stop agonising over the past and get on with living the present. At the speed he was going, the young man should have been out of sight, but as I came off the bridge I saw he was not far ahead after all. He stopped at the network of crossings at the busy junction. There were plenty of people passing by, but nobody took any notice of him — though he stuck out like a sore thumb — and he ignored them. I had the feeling he was waiting for me, and was going to speak to me. Sure enough, as I reached the crossing he asked me if there was a station nearby. “Well, there’s one over there,” I said, pointing to Kew Bridge station which was only about 50 yards away. He gave a shout of laughter, slapped me playfully on the arm, and said: “Well, that’s all right then!” — an expression I often use. He was perhaps in his late twenties, with a shining, open face, a shadow of rough beard, and laughing, penetrating eyes that made me feel warm inside. I told him there was a tube station further down, but he said that as long as he knew where the station was, he would be all right. With that, the lights changed. “Look after yourself!” he said, and I replied: “And you, too,” and crossed the junction to the bus stop. He followed slowly, stopping to stare at some posters advertising a rock band on a boarded-up shop. “END DAYS,” they announced, reminding me again of Maitreya. He was gazing straight ahead as he came towards the bus stop, and I thought he would not notice me behind the shelter, but as he passed he glanced sideways with those bright eyes and gave me a broad grin, as though he knew I was there all along. The last I saw of him was his glowing orange back as he went down the station steps. Would the Master kindly say was this vivid young man perhaps Maitreya? At Benjamin Creme’s lecture in New York on 30 July 2005, some 15 minutes before the beginning, my attention was caught by a man who looked very much like Kofi Annan. He was tall, very poised, with vivid eyes. At first I thought that he had come in because of the sign placed at the entrance of the building, announcing the subject of the talk that evening. He seemed to be casting a glance at what was happening in the lobby. Ten minutes later, I saw him standing at the entrance of the auditorium, again looking at what was going on and I concluded that he was most probably one of the organizers, standing there to answer questions from attendees. During the lecture, Benjamin Creme mentioned that “Maitreya was here tonight”. I immediately remembered the ‘presence’ of the man whose resemblance to Kofi Annan captured my attention, and most of all the calmness in his eyes and his deportment. On the night of Saturday 24 September 2005, during the annual International Transmission Meditation Conference in Rolduc, Kerkrade, the Netherlands, four moving objects were spotted in the sky. The objects were the size of a star, and were blinking like an aeroplane coming down to land. Instead of moving in a straight line like a plane, the objects each ‘danced’ from time to time, criss-crossing up and down, back and forth. Around each point of light a ring of light was visible, like a ring around the planet Saturn. Small red and green points were blinking. At one moment one of the moving objects ‘spat out’ a cloud of sparks, like a rocket in a display of fireworks, except that they did not explode from the top, but from the bottom like a fish spawning. Were they UFOs? The following is a short extract from an extensive and fascinating interview with an inspiring woman, Maggie Barankitse, whose untiring efforts to help, protect, serve, heal and educate war orphans and other victims of Burundi’s violent conflict earned her the Nansen Prize. For the full and deeply moving interview see Share International (November issue). UNICEF estimates that 358,000 children in the country have lost one parent and 77,000 have lost both parents. There are 230,000 AIDS orphans and at least 5,000 street-children. It was against this background that Maggie Barankitse found herself impelled to take action on behalf of the victims of the conflict in her country. 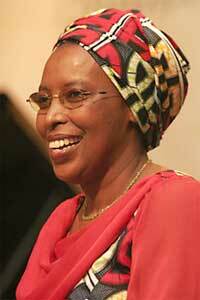 Marguerite (Maggie) Barankitse was awarded the UNHCR’s Nansen Prize in the Belgian capital, Brussels, on 22 June 2005, for her work for the children of Burundi. The Nansen Prize — the Humanitarian Nobel Prize — is a prestigious UNHCR prize given to people and institutions for extraordinary achievements on behalf of refugees and for human rights. The Nansen prize was presented by H.R.H. Princess Mathilde of Belgium and Wendy Chamberlin, UN Deputy High Commissioner for Refugees. Maggie’s is a message of hope and her achievements testify to her belief and determination that ‘evil will never have the last word’. Martine Dupont interviewed her in Brussels for Share International. Share International: You have received many international awards. What is your reaction when you are nominated for, and win, such prizes? Maggie Barankitse: It is a great encouragement and it confirms my conviction that evil will never have the final word. I am surprised and still wonder how it is possible that, out of the millions of worthy people, they have given the prize to someone in the furthest corner of the jungle. I suppose it’s because there are people in the world who love ordinary people and who love children. SI: You believe that forgiveness and living together are the best solutions to ethnic problems which caused so much cruelty and suffering in Burundi? MB: Maison Shalom [House of Peace] was created in the midst of the cruelty. For a concrete and sustainable peace a genuinely open attitude is essential. You need to look at how the wounds can be healed. You can’t avoid forgiveness, because hate destroys the victims if they cling to that rancour. There can be no more damaging enemy to a victim than to keep going over all that someone has done to them. SI: You are in the process of starting numerous ‘healing’ projects. Can you tell us something about these? MB: In the beginning we were concerned with the protection of the most vulnerable, the children. We wanted to include all the children who were victims of the war, to offer them a better environment and ensure that they have the right to protection, education, health and nutritious food. But the children were growing older; so, a long-term project had to be started, and the entire community had to be made receptive to it, so that it would be reach all layers of society. We wanted to reintegrate the children with their relatives wherever possible, which involves various steps: tracing the family and then extending help to them. We have even tried to help foster families who took in children. Some children didn’t know where to go and were unable to find a family to care for them, so we had to find houses for them so that they could leave the town centre. But you also have to give them something so that they can learn how to become self-sufficient later on. That was the start of numerous projects to generate money, so that they wouldn’t have to remain beggars for life. Those who could no longer stay at school learned skills like metal working, agriculture and cattle farming. For city children activities relating to fashion were started, so that they could learn to be fashion designers or tailors to provide for themselves. For others, small beauty salons were set up, so they could earn their living. Also, education for peace had to be developed, because Burundian anger is centred in the conflict between the main population groups. A film project was devised to give them a window on the world, to allow them to relax and also to review their history and to make it less tragic. The goal was to encourage dialogue. It wasn’t enough; the war went on and we found we were still only cleaning up the mess. Apart from the war orphans, we also integrated the AIDS orphans. But how to prevent AIDS — this terrible plague? The mothers had to become more aware of it; activities had to be devised for the mothers who worked as prostitutes, to rescue them from poverty. That way they wouldn’t have to be prostitutes any more and the children wouldn’t have to be separated from their parents. We went to the families and taught them how to prevent AIDS, and provided care for those who were already affected by the disease. It is actually not my intention to take in orphans; I want the children to grow up in their own families. So I went to vulnerable families to try to keep the parents (AIDS sufferers) alive, so that the children could stay at home. We gave them support, made sure they received medical care and befriended their children if the parents died. These children were less traumatized and saw us as friends of the family. We have a library where people can read and learn computer skills and there is a centre where English is taught. There are activities such as soap-making and woodworking — both co-operatives in which the whole local population is involved. The child soldiers have also been reintegrated into normal life, as have the mothers who fought alongside the children. We try to give total support — looking at who is weak with the goal of getting people back on their feet, so that they can live in dignity. The following is a short extract from an interview with Swami Nirliptananda in which he explains the role of religion, the need for a different approach to life and to the world’s problems. He talks of the importance of a central role in international affairs for a reformed United Nations, of the need to revise all religions and to rid ourselves of conditioning. For the full interview see Share International (November issue). 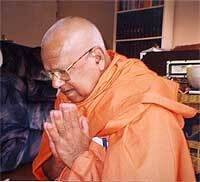 Swami Nirliptananda is a senior swami in one of the temples of the Asian community in London, deeply acquainted with the teachings of Maitreya. On a recent visit to the Netherlands from London Swami Nirliptananda kindly agreed to be interviewed again for Share International. Share International: Swami, please tell us what you see when you look at the world at present? Swami Nirliptananda: Some people looking at present conditions, at the state of the world, sometimes become sceptical about the future. They wonder what the future holds, quite naturally, because if things continue this way the hope for the future looks bleak. We have been striving for many thousands of years to build something which we can enjoy and now, having reached this point of material and technological achievement which could be of enormous benefit to humanity, we have come up against, as it were, a blank wall. SI: What has brought us to this? SN: Basically, I think it is man’s greed – his desire for acquiring things, his selfishness and his craziness, his crazy desire to dominate everything, not only other people but even the environment – nature itself. That domineering drive is the basic cause which has brought us to this point. Now, we are beginning to look at one problem very seriously: the exploitation of the environment and the catastrophic effect it is having on the weather and on other types of natural disasters. We are trying to come to terms with those sorts of phenomena in nature and our adventure into nature. What we are facing today is quite a different problem – and it is a problem that was not there before. We had wars but now we are in a situation which is not just a war where we are fighting enemies. What is happening now is that we are fighting ourselves. SN: Yes. A war of self-destruction. And it is propelled by hate – hate for man, hate of man for man. SI: What is its origin? SN: How it started and where we are heading, I believe, has a lot to do with our religious perceptions. We all have particular religious perceptions. They are not all the same. There’s much diversity. But that diversity should be looked on as an enrichment – as a way of enriching our lives, not as a point of conflict. But this is exactly what’s happening: we look on other views and other religious concepts as something threatening to our own faith or ideas. Religion shouldn’t try to impose things on people. If you impose, then it isn’t religious. In this section Share International focuses on the rising tide of people power which will continue to swell until, under Maitreya’s wise guidance, the ¬people will lead their leaders into the creation of a just society in which the rights and needs of all are recognized and met. Hundreds of thousands of people throughout North America and Europe have marched through the streets and held rallies to protest against the war in Iraq. 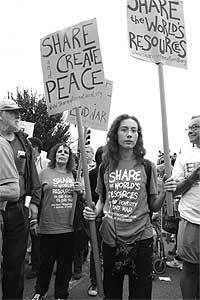 The 24 September 2005 demonstrations represented the largest peace marches since the US-led invasion of Iraq two years ago. In Washington DC, tens of thousands of people from throughout the United States marched past the White House, and joined an all-day rally at the Washington Monument. The march and rally were part of a three-day protest that included non-violent acts of civil disobedience at the White House and an interfaith religious service. Protest signs included messages such as “Bush Lied, thousands died”, “GWB is a WMD”, “No billionaire left behind, no child left a dime”, and “From Iraq to New Orleans: Fund People’s Needs, Not the War Machine”. Protestors included young activists, nuns whose peace activism extends back to the Vietnam War, parents mourning their children in uniform lost in Iraq, and numerous families motivated for the first time to protest. “We have to get involved,” said Erika McCroskey, who travelled from Des Moines, Iowa, with her mother and sister, to take part in her first demonstration. Another demonstrator, Paul Rutherford, said he was a Republican who still supported President Bush, except for the war. “President Bush needs to admit he made a mistake in the war and bring the troops home, and let’s move on,” he said. Other rallies were held in Los Angeles, San Francisco, San Diego, Seattle, Minneapolis, and many other US cities. The 24 September demonstrations reflected increasing public sentiment against the war. September 2005 opinion polls found that only 34 per cent of Americans think the war is winnable, only 32 per cent support Bush’s handling of the war and 63 per cent support a full or partial withdrawal of US troops from Iraq. In London, tens of thousands of people marched through the streets in a demonstration calling for “Peace and Liberty”, demanding that Prime Minister Tony Blair withdraw British troops from Iraq. Protesters carried banners with slogans such as “Blair Liar”, “Bush world No. 1 terrorist”, “No war, no nukes” and “Blair’s taking liberties, troops home now”. Stalin K, a human rights activist, runs a revolutionary radio programme in the western province of Gujarat, India, aiming to expose corruption. The programme started in January 2001 after the devastating earthquakes in India which killed more than 20,000 and made one million homeless. Following the earthquake, he made a radio programme called To Be Alive which investigated issues relating to compensation, government handouts and shelter programmes. Some months later he launched a very popular programme investigating abuses of power. One case involved a local politician who had collected the compensation money for the quake victims in a remote village. He held back a large percentage for himself and gave the rest to the villagers. When confronted and secretly recorded by the radio’s reporters, he denied everything. When the report was aired, he lost all credibility and was voted out of office the following year. From the beginning Stalin K has trained the local, rural people to become reporters for the programme. He explains: “They are ‘poorly educated’ but they are extremely creative and intelligent people. They write, record and edit the programmes.” Although they were only semi-literate, the medium of radio proved liberating and they learned quickly. Stalin K remembers needing to teach the trainees how to sit on a chair and now, five years on, he must remind his reporters to be respectful towards people in authority. A Brazilian bishop ended his 11-day hunger strike after President ‘Lula’ da Silva’s government agreed to hold talks on a controversial river-diversion scheme. Bishop Luiz Flavio Cappio, 59, challenged plans to reroute the Sao Francisco River, insisting that any scheme must include rehabilitation of the already severely damaged river, which currently supports millions of already impoverished farmers along its banks. The government claims its project will bring development to 12 million poor in the drought-plagued northeast, but opponents fear it will benefit only wealthy landowners, reduce the amount of hydroelectricity generated, and eventually dry up the river altogether. On 26 September 2005 hundreds of people rallied in front of the federal building in Lower Manhattan, New York, to protest against the killing by the FBI of legendary Puerto Rican revolutionary Filiberto Ojeda Rios. Ojeda Rios was the commander of the Boricua Popular Army, better known as Los Macheteros, and had been living clandestinely since 1990. At the protest a broad spectrum of people waved placards and chanted slogans demanding that the United States end colonialism in Puerto Rico, and groups played Plena, the traditional music of Puerto Rico. Everyone commented on the impressive showing at the rally and remarked how this incident had shocked the Puerto Rican community into action. The FBI had attacked Ojeda Rios on 23 September, a historic day for Puerto Rican independents and nationalists know as El Grito de Lares. The FBI now faces criticism over the killing and has announced that an “independent investigation” of the incident will take place.